The club is now closed for the Easter holidays. During school term-time the club meets on most Saturday mornings 10:00 am to 11:45 am at King's School Worcester, next to the Worcester Cathedral. Enter from Castle Place WR1 2NB. Most sessions are supervised by Ray Collett. 9 Mar. Ethan Tan wins Warwick Junior Open under-11 tournament with a clean sweep of 5 points from 5 games. 17 Nov. Winter tournament winners. Josh Clarke (The King's School, Worcester) was first winning all his games and gaining 15 points. The highest scoring primary school entrant was Ethan Tan (St Alban's, KSW) on 13 points. Following closely behind were Beau Cannon (King's Hawford Sch, Worcester) and Eamon Tan (St Albans, KSW) on 11 points. Oliver Bullock (St Barnabus Primary, Worcester) was fourth with 9 points. 6 Oct. In the first three sessions of Autumn term, members looked at night forks and how to play king and pawn endings. 16 Sep. County juniors do well in Terafinal. Current county junior champion Finlay Bowcott-Terry scored 4 points from his 6 games in the under-14 UK Chess Challenge tournamant at Peterborough, Ramesh Abhishekdev scored 3 in the under-12 section and Manvith Sandhu scored 3½ ponts in the under-10 tournament. Full results on the chess results server. 26 Nov. WJCA team wins silver medals. 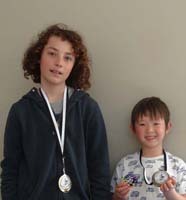 Joel Reeves (Red Hill Primary School) was the outstanding player at the Winter tournament held at the King's School Worcester in 26 November. Other club players who did well were Tamara Marsden (King's School Worcester) who was 5th and led the Worcestershire Junior Chess Academy team to the silver medal position. Young brothers Ethan and Eamon Tan (both Powick CofE Primary School) and Theo Rodgers (Bredon Hill Academy) were the other players that gained the club's success.